Lily’s homework last week was double- and triple-digit subtraction. She got stuck. Since I taught second grade for 12 years, I knew how to get her un-stuck. Take a break. Even though I prefer the term “borrowing,” I also know how to explain “regrouping” or “decide if you need to ungroup,” but in this case Lily just needed a break. She was all mixed up and frustrated. 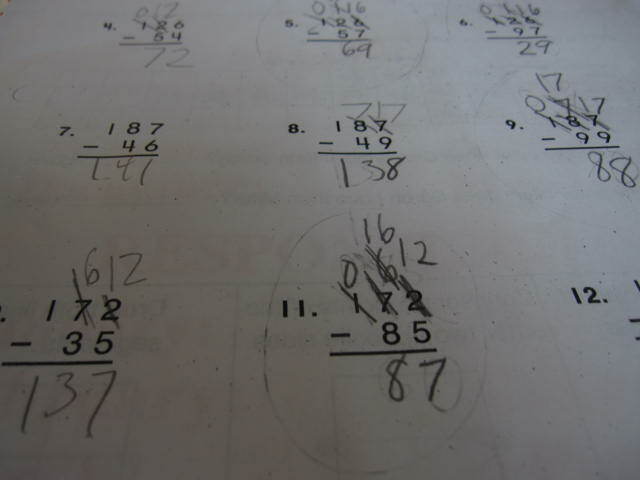 When she tackled her math problems later, she was able to focus on her mistakes and fix them. One of Mama Kat’s vlogging prompts for today was to learn a YouTube viral trend: The Cup Song. Jen from Buried with Children contributed this idea. I don’t know whether to thank them or curse them, because I became obsessed. I practiced over and over again and still couldn’t get it. I got stuck. I had to take a break, which was really hard because that d*mn song was in my head, constantly. Plus, my hands hurt from banging that stupid cup. I took a much needed break and tried The Cup Song again…later. I focused on fixing my mistakes. It didn’t work. Here is my imperfect remake of The Cup Song, recorded in my kitchen with a Live Audience and a new title. Presenting: The Sippy Cup Song! See the original song You’re Gonna Miss Me here. You are awesome Ginny!! My daughter does the cup song all the time..LOL..You did it fantastic!! I love your videos!! I have just got to try it..I'm too perfectionistic! AND I don't take good pictures let alone video..oh well I need to get over myself..don't ya think! LOL_Blessings! That was awesome! You have so much more patience than I, especially when your daughter was trying to distract you. It was funny though! Awesome job! The song and your girls' reactions brought a smile to my face! Thank you, Chris! We had so much fun learning this song! Fantastic! That is not easy!! So cute! My recent post What do you want to be when you grow up? That sippy cup song is too cute! Love it. I am certain I am not coordinated enough to pull that off. Holy Cow. I don't think I'd be more impressed if you won a Pulitzer. Okay, maybe a smidge more with the Pulitzer but you did awesome. And I am in desperate need of help teach my 2nd grader how to "borrow" for subtraction. He has trouble with math anyway and this is KILLING me. It was comforting to know that others are struggling with this too. You are so sweet! Yes, we definitely struggle with math! That whole concept of borrowing is really hard for second graders to understand. Hang in there, he'll get it! That was awesome! it's not as easy to do as some people might think — you did great!!! Aw, thanks…and you're right…it's really hard! Some of the videos on YouTube make it look so easy! You did so great!!! I had never even heard of this song before the workshop (I don't get to the movies much or follow pop-culture, obviously), but darn, it is catchy! I may have to have some fun with my girls and learn this thing myself. My recent post Vlogging Workshop: What Do You Want to be When You Grow Up?